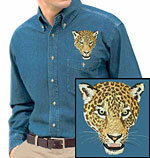 Men's Denim Shirt with Jaguar High Definition Embroidery Portrait #1. The 7 oz. 100% cotton denim stonewashed shirt has left chest pocket with button, yoke back and button down collar. The Font Style you schoose will be applied to all the custom text you order.